Lanphan 2XZ series rotary vane vacuum pump is one of the basic instruments for removing gas from a sealing container.There may be several kinds of problems in the operation of rotary vane vacuum pump. Today, lanphan will tell you how to perfectly solve the common failures of rotary vane vacuum pump. What are the common failures of rotary vane vacuum pump?Lower vacuum degree, overload operation of the motor leads to stuck, noise, oil leakage, oil injection, difficult to start, no pumping, etc. Let’s see how to eliminate the rotary vane vacuum pump failure. 6. The oil path is blocked, and the proper amount of oil is not adhered to the pump chamber. 7. 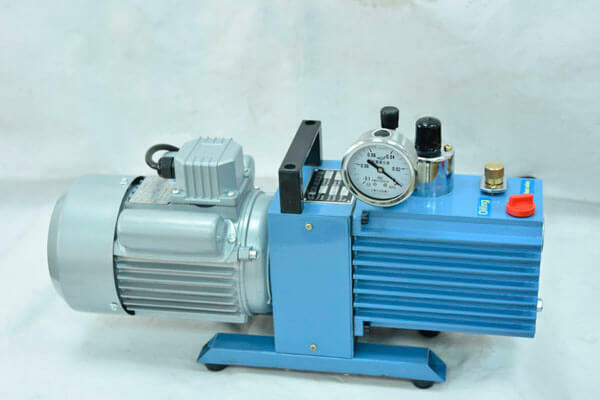 When the rotary vane vacuum pump is operated, the temperature rise is too high, so that the pump oil concentration becomes thinner, the sealing property is deteriorated, and the oil vapor pressure is increased. 8. When the diaphragm in the pump is pressed in, the interference is too large, causing the pump chamber to bulge and leak. 9. The exhaust valve is damaged and the seal is not good. 10. Improper assembly, end cover plate screw tightness is inconsistent, the rotor axis displacement. 11. rotary vane is not flexible. 5. Check the fit clearance between the pump chamber, rotor, rotor blade and end cover plate. 11. Grinding rotor and rotary vane, interchange spring. There is noise while the pump is running 1. The spring is broken and the impact sound of the rotary vane is emitted during operation. 4.Pay attention to deflation when stopping the pump and check if the differential pressure valve is working properly. 5. examine and maintain the power supply. Pump does not pump 1. Damage to the pump coupling or pulley key damaged caused the rotor not rotating. 2.Double stage pump rotor cross joint damage, high vacuum stage rotor does not rotate. 3. Pump inlet valve is not open.